By now most everyone has had the pleasure of encountering aromatherapy, which is sometimes known as essential oils, in some way. Many of your clients have likely experienced the relaxing effects of a lavender-infused bath after a stressful day of work or perhaps treated themselves to the soothing relief of an aromatherapy massage. Likewise, many skin care manufacturers have found it advantageous to incorporate these oils into their products, using them as active ingredients and fragrances. It is obvious that essential oils are added to just about everything today, from skin care and hair products to room diffusers and fragrant candles, as they complement any environment and inspire feelings of well-being. Aromatherapy has been touted and promoted by so many different industries as of late it seems that the term is exercised more frequently than the true practice itself. So it is not surprising that aromatherapy is often perceived by misinformed consumers as nothing more than a feel-good therapy. The truth is, there is much more to these extracts than meets the eye—or rather, the nose. Aromatherapists, herbalists and naturopaths have been successfully treating their clients with aromatherapy for years. As a spa professional working in the skin care industry, it is probable you will have the opportunity to work with aromatherapy oils in your treatment room at some point during your career. If so, it is not enough to simply have a superficial understanding of the oils when you plan to incorporate them into your skin and body care treatments. A profound knowledge of this multifaceted science should first be acquired. In the following, get a closer look at several aspects of this ancient, yet everlasting, phenomenon that appears to become more fascinating with time. 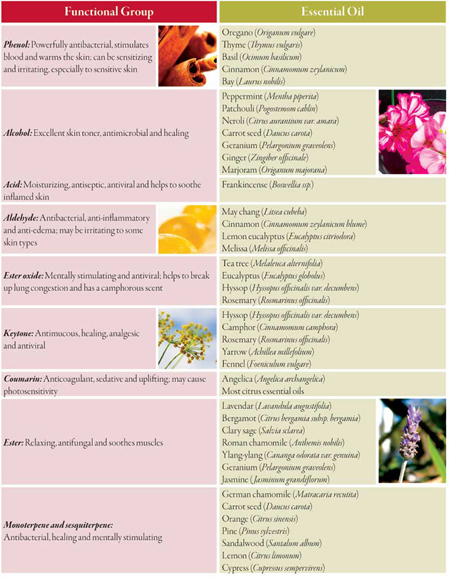 Essential oils contain potent, biological constituents and are found in certain aromatic plants. They have multiple healing capabilities and are extracted from different parts of various plant species. The constituents are an integral part of the plant and are often considered the life force or life blood of that plant. These constituents are what make essential oils so vital, as they have incredible medicinal properties. Each oil has its own unique fragrance, individual to the plant that possesses it. The fragrance is Mother Nature’s way of propagating the species, attracting pollinators and repelling predators. Aromatherapy is closely related to herbalism and is a respected branch of complementary medicine. When administered by a knowledgeable practitioner, it can help to achieve and maintain homeostasis of the body by working synergistically with one’s own immune system. There is little doubt that what makes essential oils so alluring are their exotic aromas; however, it is their innate ability to help heal in a variety of ways that make them exceptionally beneficial. And the answer to how these extracts provide such extraordinary capabilities lies within their chemistry. On a molecular level, each essential oil is comprised of many different atoms—the smallest unit of all matter—bonded together to form molecules, which are the building blocks that form compounds. An oil may encompass a varied group of compounds within its chemical network, which can contribute to its healing diversity. Compounds of different combinations of oxygen molecules are known as functional groups, which account for the properties and effects of the oil. To view a simple list of several of the major functional groups, their properties and the common and botanical name of the essential oil associated with each group, see Aromatherapeutic Oil Groups. Although an essential oil may belong to more than one group, it will be categorized according to the functional groups that are most dominant in the oil. Unfortunately, there are far too many functional groups and essential oils to list them all in the context of this article. Therefore, only the most common are included. Now having a more in-depth understanding of what essential oils are and how they work, you can learn more about the glamorous side of these liquid gems. Smell is an amazingly acute sense that can mysteriously attract a treatment recipient. An aroma can be incredibly alluring, having the uncanny ability to penetrate the memory. Sense of smell is steeply linked to the memory because the part of the brain that registers odor is also related to memory and emotions. If you think of some of your favorite fragrances, you can likely recollect a time in your life that was most enjoyable. A scent can often positively or negatively influence the psyche depending on an individual’s past experience associated with the smell, so it is important to take this into consideration when servicing a client with essential oils. There are many ways in which estheticians can administer essential oils to their clients. See Scented Suggestions. Having an understanding of your client’s medical history, knowledge of the essential oil you’re using and any contraindications it may have, as well as confirming that your client has not had a negative reaction to the oil or its scent in the past, is crucial before beginning any treatment. It is the spa professional’s responsibility to obtain this pertinent information before each service. To help prevent unexpected side effects, make sure the oil you are using is a natural extract rather than a synthetic imposter. Purchasing from a reliable manufacturer that sells essential oils by their botanical name is likely to be one of the safest sources. Despite the recent hype aromatherapy has received by many who are eager to receive a piece of the market share, it is important to remember that it is a genuine science and should be treated with due respect. One of the oldest medicines known to the world, essential oils can be dangerous if not used correctly. When administered safely and appropriately, however, they can have a positive effect on one’s overall health and well-being. It is little wonder that they have played such a great role in civilization for such a long period, as aromatherapeutic oils and their outstanding benefits have certainly stood the test of time.